2 private feeding rooms, 2 kids' toilets, 2 change stations, microwave, sink and chairs to relax. Photos taken 15th Dec 2013. 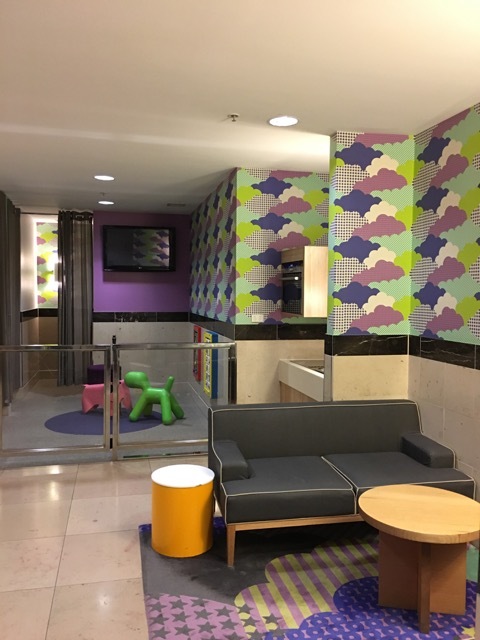 3 private feeding rooms with comfortable chair, CCTV screen in rooms to watch siblings in separate play area, 3 changing bays, gated play area with an interactive screen, 4 changing bays with comfortable lounge. Kids & adult toilets and benches with microwave, Phillips avent milk warmer and sinks Photos taken 20th Nov 2017. 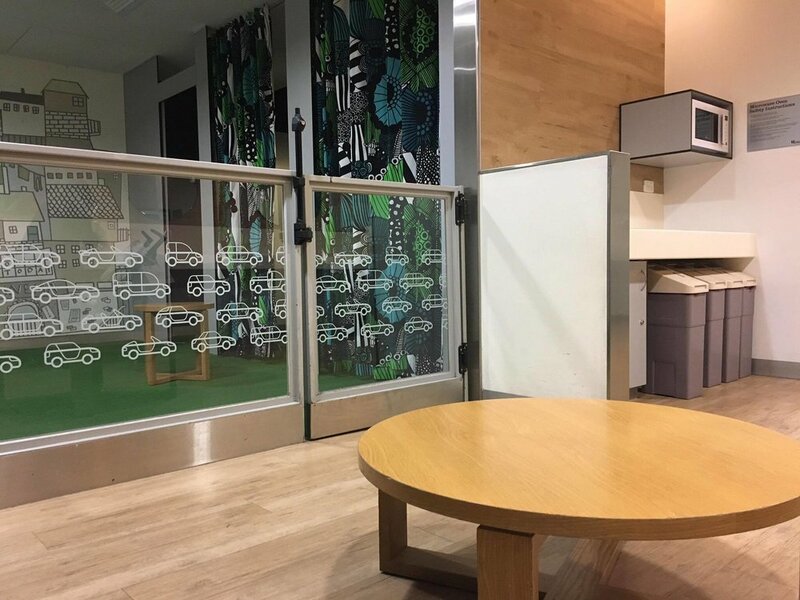 3 private feeding rooms with a little play station on wall, CCTV to watch siblings in separate play area, 4 changing bays, chairs and kids' play area with television and interactive screen. Kids toilets and two benches with microwave and sink. Photo taken 7th Oct 2014. 6 changing bays, 3 private feeding rooms, play area, snack area, microwave and sinks and kids' toilets. Photos taken 14th September 2015. ABA 5 star rating. 3 changing bays, 4 sinks, couches, 2 microwaves. Photo taken 4th Dec 2016. Not a parents' room per say but the fancy disabled toilet has a change table. Photo taken 11th Sep 2013. 2 private feeding rooms, common area with lots of seating, 2 change stations, kids' toilets, microwave and sinks. Photos taken 15th Dec 2013. ABA 5 star rating. 1 change station, 1 chair and toilets. Photo taken on the 15th Dec 2013. 2 changing bays, 2 private feeding rooms, play area for kids, microwave, sink, highchair and couch to relax. Photo taken 22 July 2016. 3 change tables, 2 private feeding rooms, wall play station, microwave, sink but no kids toilets. Photos taken 25th July 2016. 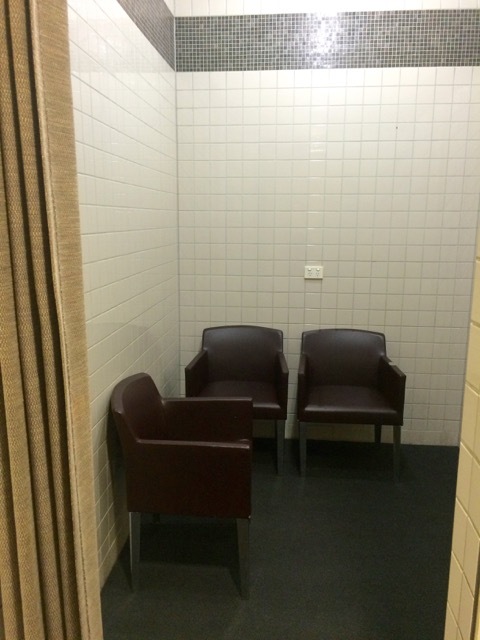 2 private feeding rooms with comfy couches, 2 change stations, couch, microwave, sinks, kids' toilets and highchairs. Photos taken 15th Aug 2013. 1 changing bay, 1 sink, 1 kid & adult toilet and a cool round seating area. Photos taken March 2019. 3 private feeding rooms, 4 changing bays, sinks, microwave, kids toilets, couch, tv dog and elephant toys as well as wall stations. Photos taken 21st Oct 2016. 2 private feeding rooms, 3 changing bays, sinks, microwave, kids toilets, couch, tv dog and elephant toys as well as wall stations. Photos taken 9 June 2017. 3 private feeding rooms, 3 changing bays, sinks, microwave, kids toilets, elephant play station, tables and chairs. Photos taken 1st Nov 2016. 3 private feeding rooms, 3 changing bays, sinks, microwave, kids toilets, truck toy, tables and chairs. Photos taken 1st Nov 2016. 3 changing bays, microwave, sink, kids gated play area with rocking horses & donkeys and tv with interactive game and cubby lounge. 3 private feeding rooms. 1 kids & 1 parent toilet. Photos taken 3rd Dec 2015. 2 changing bays, microwave, sinks, cubby lounge areas, 1 private feeding room and 1 kids & 1 parent toilet. (TV not working). Photos taken 3rd Dec 2015. 2 changing bays, microwave, sinks, cubby play area, 1 private feeding room and 1 kids 1 parent toilet. Photos taken 18th July 2016. 2 changing bays, microwave, sink, no play area, 3 private feeding rooms. 1 kids & 1 parent toilet. No photos, visited on 3rd Dec 2015. 2 changing bays, microwave, sink, no play area, 1 private feeding room and 1 kids & 1 parent toilet (Toilets not working). No photos, visited on 3rd Dec 2015. 3 private feeding rooms with live camera feeds (to watch older siblings), 4 changing bays, sinks, microwave, bottle warmer, tv with interactive games, bead frame table, bean bags, kids toilets and lounge. Female toilets nearby also have kids toilets. Photo taken 27th Oct 2016 by Melbourne Munchkin. 2 private feeding rooms with a change table in one, 2 change stations, sink, microwave and kids toilets, Photos taken 27th Jan 2016. 2 private feeding rooms, 1 wall play station, 2 change stations, sink, microwave and kids toilets. Photos taken 27th Jan 2016. 2 private feeding rooms, 2 wall play stations, 3 change stations, sink, microwave and kids toilets. Photos taken 6th Jan 2014. 3 private feeding rooms, 3 change stations, sink, microwave and tv in the play area. Photo taken 6th Jan 2014. ABA 5 star rating. 2 private feeding rooms with a change table in each. Microwave, chairs and kids' table in foyer. Photo taken 5th Apr 2013. ABA 5 star rating. 4 changing bays, microwave, sinks, chairs and kids' toilets. Gated area with a television, 2 kids wall play stations and 3 private feeding rooms. Photo taken 12th Feb 2015. 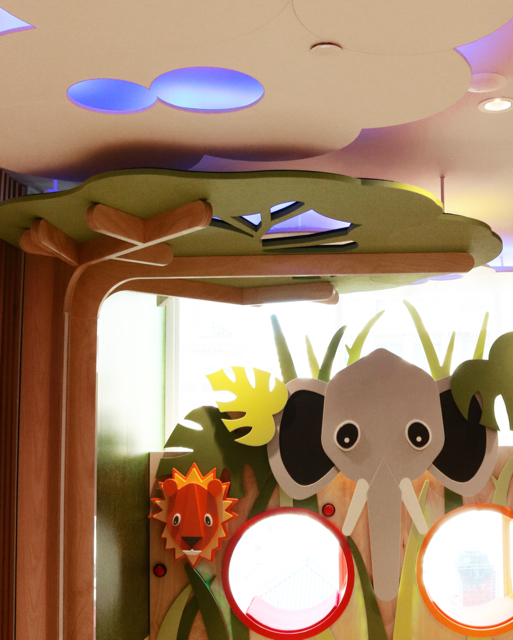 3 private feeding rooms and 3 changing tables, tv in the play area, chairs & tables and play area with large bean bag and stools. Parents & children toilets. Area is closed with child gate. Photos taken 27th Jan 2015. 4 changing bays, microwave, sinks, chairs and kids' toilets. Gated area with a television, 2 kids wall play stations and 3 private spacious feeding rooms. Photos taken 29th Aug 2013. 3 changing bays, microwave, sinks, chairs and kids' toilets. Gated area with a wall play station 2 private feeding rooms. Photo taken 2nd Sept 2015. 1 private feeding room, 2 change bays, 2 sinks, microwave, kids toilets, television and kids play wall stations. Photo taken 27th October 2016. 2 private feeding rooms with a change table in each, 1 change station, sink, microwave, kids' toilet, television and kids' play wall stations. Photo taken 5th June 2013. ABA 5 star rating. Private feeding room, two change tables, sofas and chairs. Photo taken 15th June 2014. 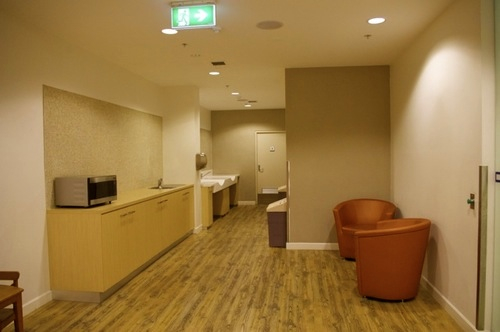 3 private feeding rooms with 1 change station in each, 3 change stations, sink, microwave, kids play area and kids' toilets. Photos taken 11th Dec 2013. 1 change table, microwave, one chair for feeding. Photo taken 6th Dec 2015. 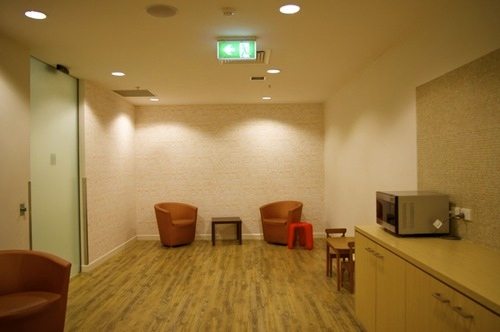 Private feeding room, two change tables, microwave, sofas and chairs and toys for little ones. Photo taken 6th Sep 2015. Private feeding room, two change tables, microwave, sofas and chairs and toys for little ones. Photo taken 20th June 2016. Looking for things to do with the kids in Melbourne - checkout our Daily Spots List for a handy list, blog or CBD Free activities.